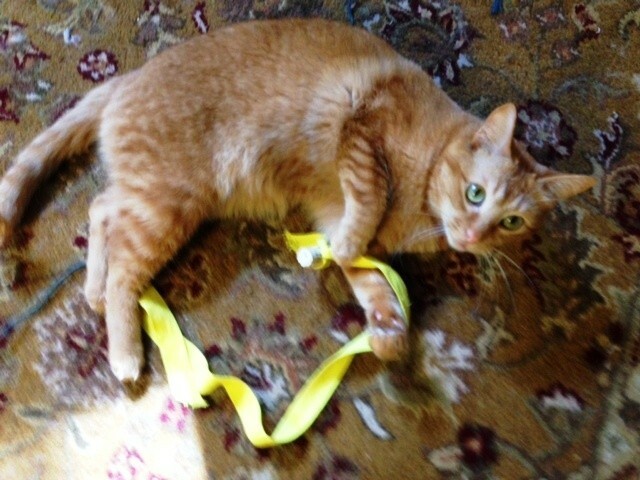 Grab strings for 2 toys at once — the one you were playing with and the one your “brother” was playing with — and pull strings in tight to body with paws. Flip over, thereby twisting much of the string and several of the toys under yourself. That way no one else can come along and steal the toys until you’re through. 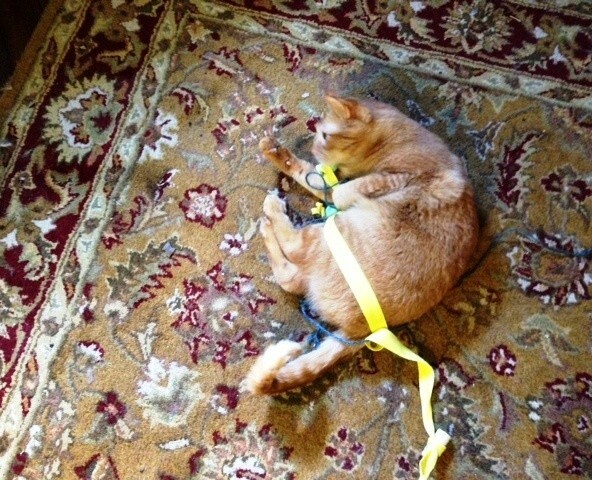 When you finally stand up, be forewarned that one or both of the toys might be wrapped around your tail or torso. Within a few steps, you should be able to shake or bite them off your body. 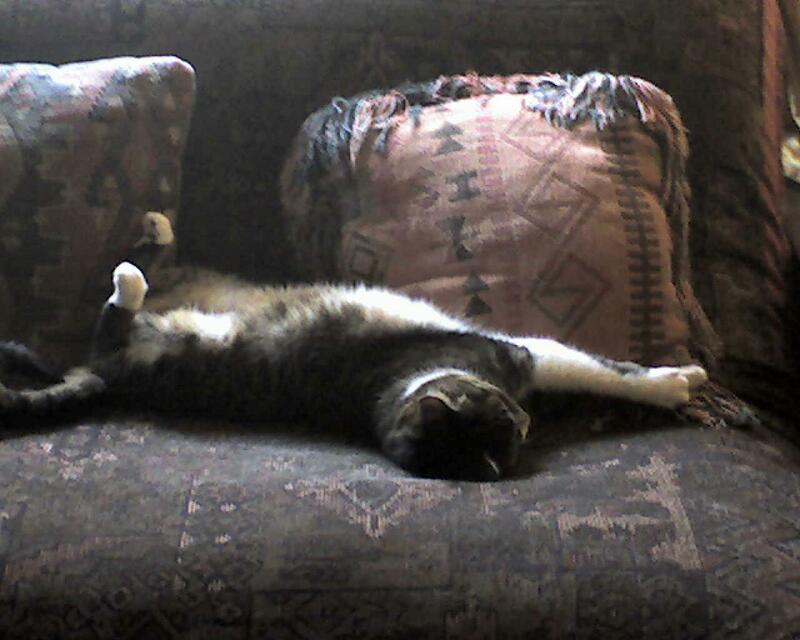 My dear sweet Tiggin was one to fall asleep in some of the most amazing positions. She practiced what I can only describe as “sleep yoga.” Here she is in that classic Hatha pose, spinal twist. No matter how uncomfortable her sleep positions seemed to me, she always looked elegant and graceful as only a cat can do. 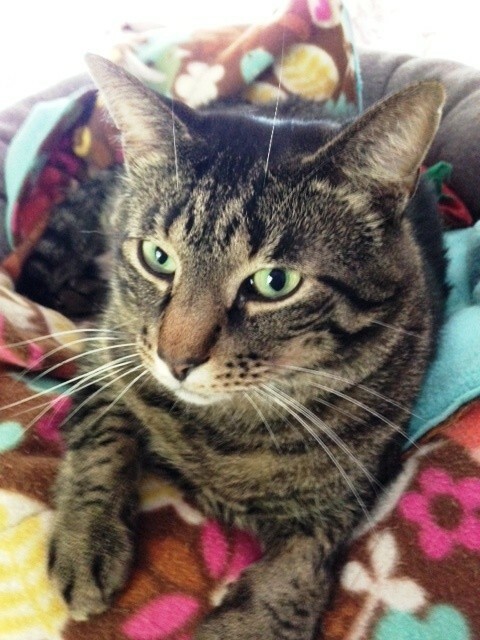 All the fur furs seem a bit rumpled when they first wake up, but none more so than Caesar. There’s something about his face that just seems rearranged when he first awakes. Maybe it’s the funny positions he sleeps in, or maybe it’s just that he’s got a very-expressive face. 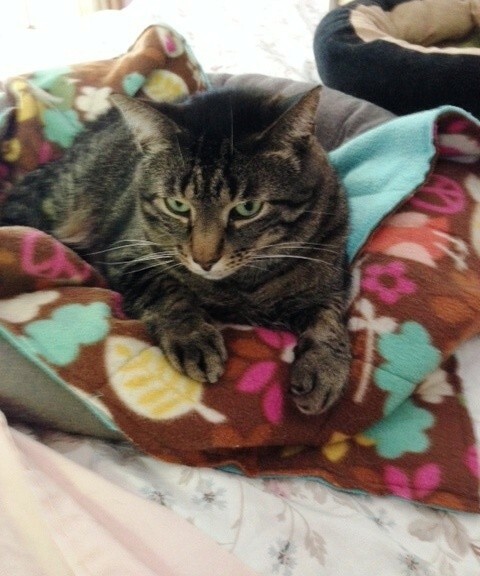 If you wake him before he thinks he should be up, you’re often greeted by a bit of a Caesar scowl. If you walk forward and try to pet those adorable soft paws, they simply disappear under his chest. Infinitely annoying human! Once again, pink mousie has been involved in further adventures. The other night, as I lay tossing and turning and unable to fall asleep, the Baby Comet brought me the pink mousie in bed. When I reached over to pet him and pick up the toy, I found it was quite soggy — most likely having had a swim in the downstairs water bowl. Mmmm, nothing like a wet cat toy in bed at 2 a.m. to help you fall asleep! Next, Mac jumped into the action and liberated the toy from Fireball and dragged it over closer to me. Thanks, kitties! I dangled the toy in the air a bit and she took off with it in her mouth and that was the end of that…or so I thought. Next morning when I came downstairs for breakfast, there was pink mousie returned to the kitchen. 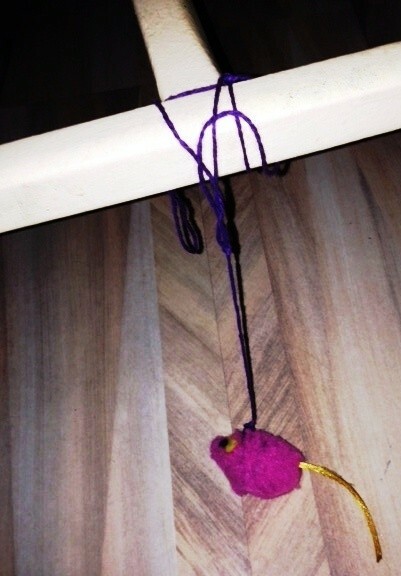 This time, I found the toy dangling from its purple string under a kitchen chair. Now I’m not entirely sure how this happened, but surmise someone went running around under the chairs, then jumped back through chasing the toy, only to have its long string wrap around the bottom of the chair, ending the fun until the human liberated it again. Pink mousie surely will be off on more adventures. 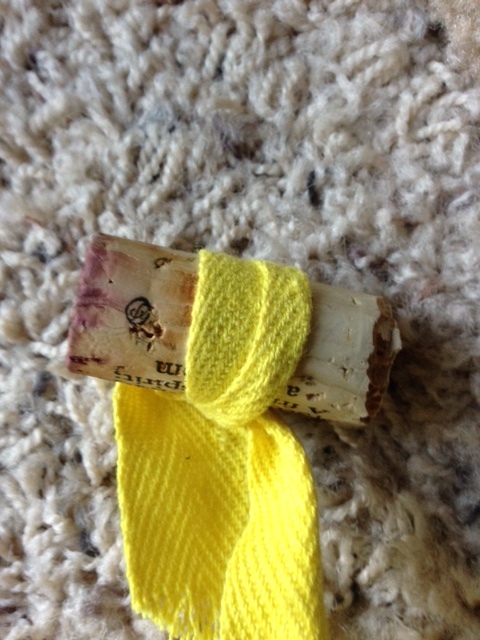 One of the best and most appreciated “found” cat toys in this house is a simple cork from a wine bottle. I surmise it’s a combination of the cork’s shape, weight, size, and texture plus bounce-ability that makes this so. They are soft enough to bite into and carry around, and probably about the size and weight of a real mouse. Then there’s the added benefit that, with a flick of a paw, they roll quite nicely down the stairs and, when they hit a hard surface, they bounce and bounce. 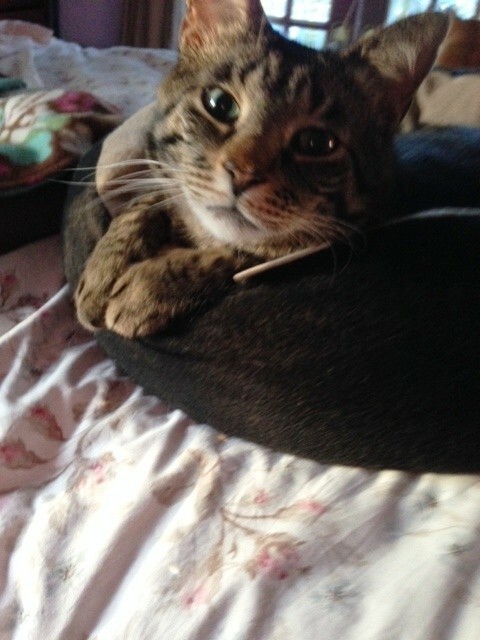 Last, there’s the fact that the shape allows string, cord, or ribbon of all sorts to be tied around the middle of the cork, once again putting the human to work entertaining the cats by pulling the cork around on the floor, or dangling it teasingly off the kitty condo. 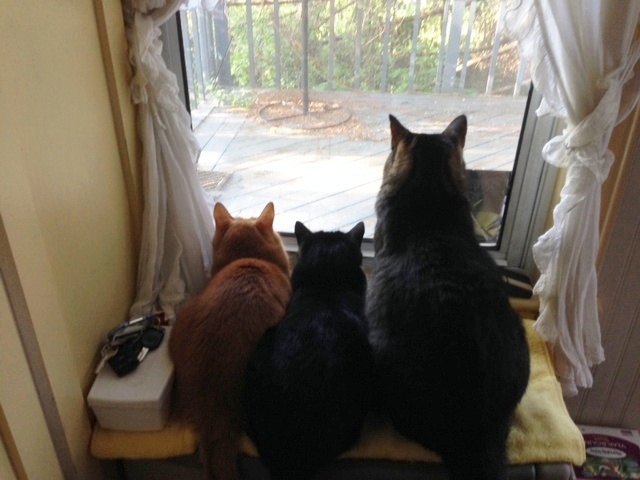 A small red squirrel caused a lot of commotion this week when he was seen running around on the deck right below the watch of the kitties. It’s a good thing there’re 2 panes of glass and a window screen between them and him, or he’d become a squirrelburger fast! Mac loves to climb up into windows and look out. 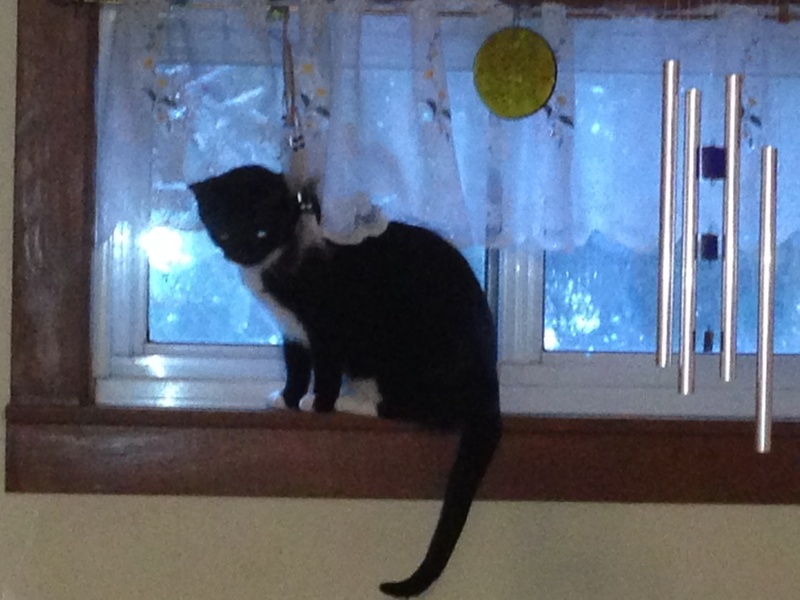 She and her “siblings” enjoyed just such perches at their foster mom’s house, so any window in this house is fair game. If that window also should sport a tray full of plants trying to capture some sunlight, and she can have a snack along the way, all the better. Life as a cat is so good! You woke me up for what reason? Then you wonder why I hide my paws when you come around. Humans! Can’t live with them, can’t live without them…NOT! When I came down for breakfast the other morning, there was a lump under a rug that sits in front of the refrigerator in the kitchen. I’ve learned to look when I encounter things like this, as you just never know what might be lurking under there. Alas, I found 2 toy mice. After the cats were fed and I’d sat down to have my own breakfast, Mac the Merkitty came over for a play. She kept trying to flip the corner of the rug up in the air and scoop the toy mice out from underneath. (Those splashasaurus flippers come in handy when hunting.) During one especially vigorous flip-and-scoop maneuver, a blue mouse came flying — literally — out from under the rug and landed in the middle of the kitchen floor. 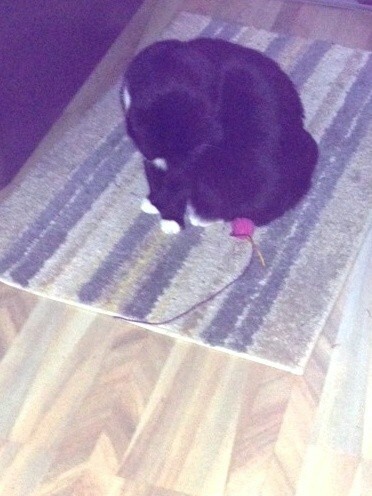 Mac kept up her efforts until she managed to snag the pink mouse from its hiding spot. That mouse had been tied with a long purple string earlier in the week so I could drag it along on the floor for a little kitty entertainment. You’d think if the human wasn’t pulling it around, it wouldn’t be any fun, but this mouse has seen some serious action on both the first and second levels of the house this week. I’m not sure if they drag it by the string or carry the mouse in their mouth, but here it was again. 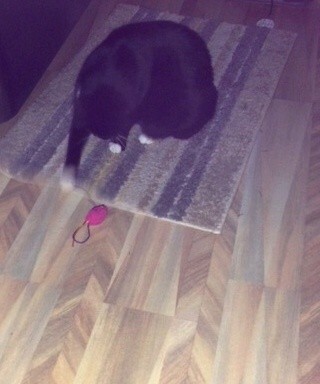 Eventually Mac did successfully hook the pink mouse and pull it out. Of course, the toy was still attached to the string, and most of the string was still under the rug, which led to some additional fun as she tried to figure out how to retrieve mousey’s long tail. Well, the Mermaid girl has a new cuddle buddy. One of my friends still remembers that I used to like unicorns when I was far younger than I am today. 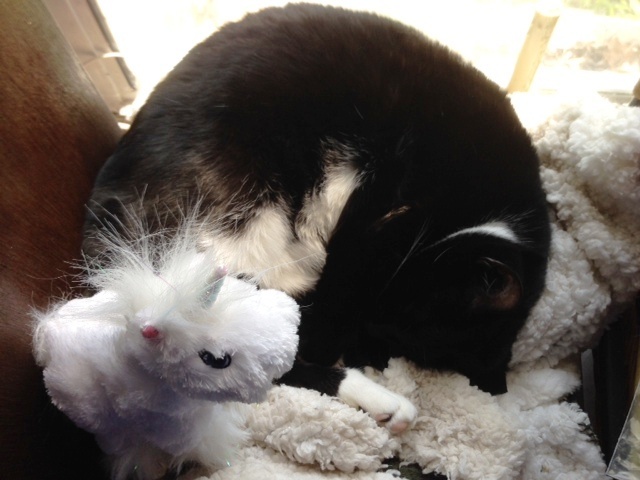 Recently, she sent the kitties some snacks and me a little stuffed unicorn toy, which I had had sitting on my desk. 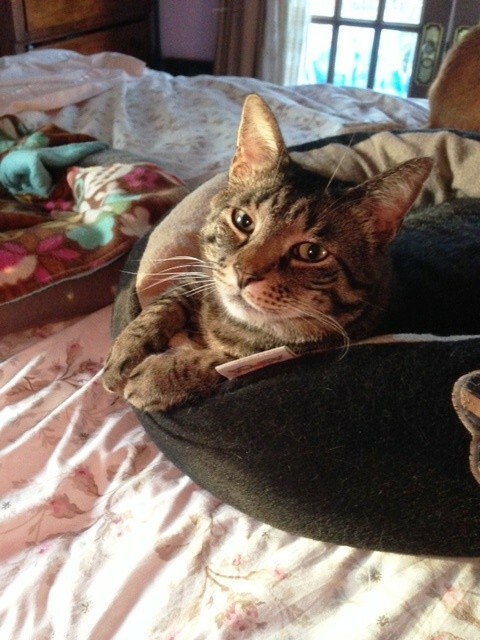 Mac found the toy and started nuzzling it, so I moved it to her kitty bed in my office. 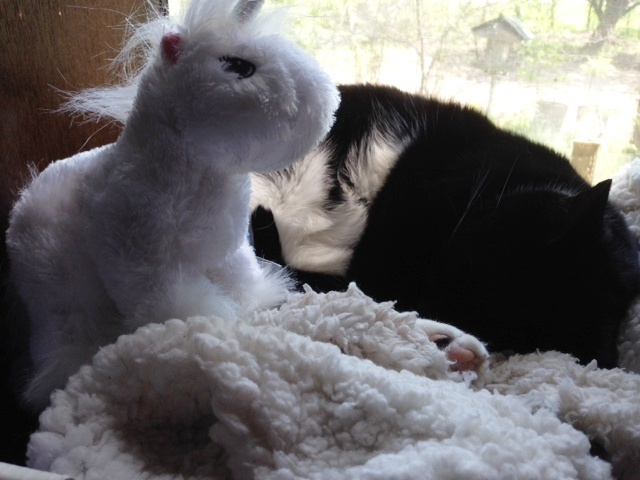 She’s been snuggling with the unicorn of late, who stands guard while she grabs a little shut-eye. I’m happy to report that thus far she hasn’t tried to chew any of the unicorn’s appendages off. 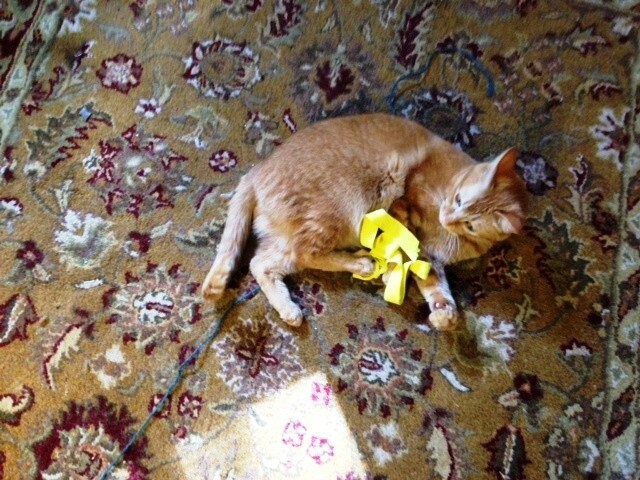 The same cannot be said for her own toys…. And note the cute pink and black toe pads? Alas, those adorable yet mischievous feet are not webbed.